A spectacular sculpture of Big Jim Larkin, founder of the Irish Labor Party, stirs the clouds from its pedestal in the middle of Dublin's O'Connell Street. Instead of recording the appearance of the statue from the front, as most photographers would do, I saw this statue as a symbol of an appeal to a higher authority. I moved behind the statue, backlighting it, and placed my spot meter on the brightest portion of the cloud. 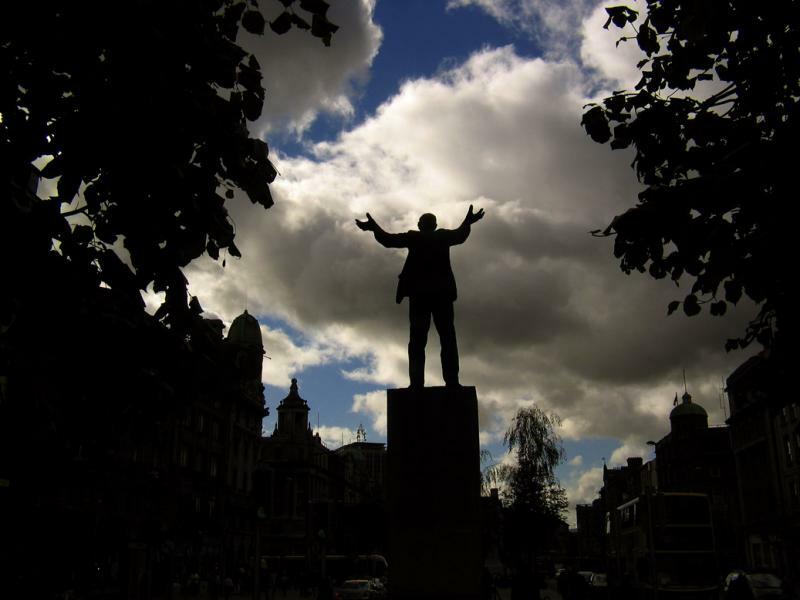 Larkin and the distractions of downtown Dublin – traffic, pedestrians, and the trees that frame the statue, all are abstracted into black shadows. The image becomes a symbol of a symbol. Instead of a describing a statue of an Irish labor leader, I attempt to create a metaphor for man’s futile efforts to control his own destiny. We may beg and plead and shout at the heavens all we want, but in the end it will still rain on our parade. I inadvertently deleted a comment today from Sofia Solomennikova, who said she liked the composition of this image. Earlier in the day, I had left a comment on an image that she made of a monumental statue in Volgograd, Russia (http://www.pbase.com/image/106646910 ) noting that her image, which features a subject placed off to the left, is a good example of composition based on the actions of the statue itself. On the other hand, if her statue had expressed movement to both sides at once as this one does, a centered placement such as I use here might have worked quite well. We compose our images based not on the "rules of composition," but on the nature of the subject and what we are trying to say about that subject to our viewers. The perfect person to comment on this Irish picture! Niall O'Shea! I am delighted you feel that I've done it justice. It is among my favorite images from my day in Dublin. Having seen it in real life, I know you've done justice to it here. Perfect POV, contrast and composition. You may only be 11, Sarah, but you speak with a strong voice. I agree. There is not much information here for a school report on this statue as an Irish landmark. That's because this website is about photographic ideas, not the subjects of our photos. As you will see, I am talking here about what this picture makes us think about, rather than Big Jim Larkin and his political career. Great image. But what if we needed information on this MAGNIFICANT piece of art. I for instance was looking for information for my school project on Ireland, in which we needed to include a photo of the landmark and information on it. I chose this one. Thanks, Nut, for your comments on this picture. You seem to understand the meaning of the picture, even though you've asked me what it means. You say that that this guy thinks he can stop this group of clouds and talk to them. OK. Man thinks he can do anything, right? Even control nature. But as we know, all too sadly, man can't control everything he wants to. And that is what this image is all about, Nut. As I said in my explanation, this picture of a symbolic man shouting at the clouds is my metaphor for man's futile attempts to control his own destiny. I say that he may beg and scream at the heavens for what he wants, but these clouds will still rain on his parade. This image has been interpreted differently by three of my friends. Bruce, Jen, and Likyin. Each of them interpreted this image according to who they were and how their own imaginations worked. That is wonderful. I want my pictures to say different things to different people. Photographic meaning is always open to individual interpretation. In fact, the idea that you just excluded -- man thinking he is big enough to argue with the clouds without fear -- is valid meaning in itself. What do you think of this now, Nut. You put your leaves as the frame of photo again. But I feel ok for that. This guy must be a talkactive one who can stop the group of clouds to stop and listen and/or discuss with him. I have no idea what he discussed about with the cloulds. So what is the meaning of this photo that you want to tell me. Excluding a talkactive guy against something big as the clouds without fear. As you can see, your comment comes on the heels of a wonderful discussion about intentions and meaning that I have been having here with Likyin Yeung and Jen Zhou, two of the most imaginative artists I've ever had the pleasure of knowing. My purpose in making this image was to stimulate ideas in the minds of my viewers through abstraction, and I feel I have certainly accomplished that here. I saw Jim Larkin as representing man's futile attempts to control his own destiny -- waving his arms ineffectually at a storm about to hit. If you saw gracious humor in my comment, I'll gladly accept that gift. Likyin took another view of it altogether. She wanted the picture to display as much energy as possible in addition to the waving arms -- including blowing leaves and moving traffic. Jen saw my image completely differently. She does not see man's futile efforts of controlling his destiny in my image at all. She sees my message as one of hope --those clouds, she says, will clear, and all will be well. Jen tells us more about Jen here than about the picture. She reads her own aspirations into the picture, as I intend. If each viewer can see what he or she wants to see in this image, and give it thought, then my picture succeeds as expression. It's not the precise meaning I want to get across here that's important. Rather, It's the range of meaning that this image provokes in the minds of my viewers that gives it its value as expression. Until I read your caption, I thought of this as an appeal - but a hopeful one. I enjoyed your perspective - but I assumed it came gently wrapped and tinged with gracious humor. At least, that's how I "heard" your words. The juxtaposition of lights and darks is powerfully graphic. Our difference of opinion over this image proves my point that no matter what we try to say to others in our images, and no matter how well our picture expresses it, many of our viewers will either miss our point altogether, or else come with up with an entirely new meaning for the picture, as you did. This is a strength of photography, not a weakness. I think that pictures with multiple messages are more successful that a narrow based image with an obvious meaning. Don't you? You do an excellent job here of telling us why you see hope, and not futility. You see positive meaning in that patch of blue sky. You look at that little black shadow in the center of the picture, as a potential strength, not a threat. You and I have been discussing Minor White's theory of equivalence as it affected you in my sunset image athttp://www.pbase.com/pnd1/fresh_vision. We agreed that you were "mirroring something in yourself" when you told me what that image meant to you. Are you not also mirroring something in yourself here? You see in this picture what you want to see. I have triggered a response in you, Jen, that causes you to project your own hopes and dreams into this image. That's why you see hope here, while I tried to comment on man's futile efforts to control things larger than himself. Once again, it's not a matter or right or wrong. I made this image to say one thing, and you saw another. Thanks, Jen, for constructively opposing my views and intentions here for the first time. I am sure it won't be the last. We can learn a lot about photography and about ourselves from such disagreement. Looking at this picture, I am as if standing among a crowd of Irish people all looking up to our leader who is right ahead, standing tall, waving his arms shouting out: be brave people! let's stay together to fight for our future..
As a ordinary citizen going through a hard time, evenything around seems dark. Trees and buildings block my view to see our destiny, but that little black shadow in the center of the picture gradually become the certer strength in people's hearts. We can see a little hope in him, however, the small part bule sky gives us more hope because sooner or later it will all clear up again and everything will be right then. Instead of seeing the futile effort to control destiny, I see more hope in this picture. What a brilliant critique of this image, Likyin! I love this image, just the way it is, and for what it says. As I said in my explanation, my purpose here is to express man's futile efforts to control his destiny. My subject placement, and vantage point and symmetry, the way I exposed on the white cloud to make it and everything else darker, and most important, the fact that everything is frozen in place -- not moving -- all express that futility. His waving arms, stopped forever in time, underscore my point. So why, then, do I think your critique is so good? Because you see a completely different way to say the same thing. You show us step by step here that may be another way to reach the same goal. I did take many vertical pictures, Likyin, but they seemed to limit the influence of his arm waving appeal here. I took off-center shots, too, but I thought that centering him represented man's own conceited concept of being at the center of the universe. I did not want to include details of the road or traffic because it was cluttered and distracting, so I underexposed it. And there was no wind to make the leaves wave a salute. You make a valuable contribution here in challenging my approach. We must agree to disagree here, Likyin. And that is what is so great about photography's potential for expression. Every photographer brings their own vision to bear on a subject and every viewer does as well. As this dialogue proves. Thank you for these comments -- I will always think of them as I shoot. Backlighting did make the abstract to show part of the meaning. But, by putting the man in the middle, everything stuck, instead of being provoked. If the fantastic clouds stands for destiny, and the traffic stands for mundane movement, both of them haven't helped you a lot by this symmetrical framing. How about a vertical composition with the man at the bottom and more clouds ahead, or, an vantage point which could show the context of the road and traffic MOVING under his feet, or even, wait till a windy moment and let those leaves around him WAVING ... well, the first one is the easiest to accomplish. The point you want to make is his to "control", to "lead" and to "conduct". It's all about to influence, to make things around him to change, to move, not to freeze, I believe.